The tiny Danio rerio, commonly known as Zebrafish, is securing momentous interest in scientific research as a useful model organism for multiple studies from gene function to vertebra developement. In mid-2017, the largest Zebrafish facility in Africa, and second largest in the southern hemisphere was officially installed at North-West University (NWU). The impressive facility, which was funded by the National Research Foundation National Nanotechnology Equipment Programme, was equipped with the Techniplast holding system technology, and the installation successfully instated by Labotec, the local representatives for Techniplast. This state-of-the-art facility has four Zebrafish multi-linking housing systems, one quarantine standalone system, four toxicity rack systems and two amphibian housing systems, which all occupies a space of 515 m2 in the newly constructed Biological Science building. “Zebrafish are thought to strike an excellent compromise between system complexity and practical simplicity”. The transparent body of the embryo and juvenile Zebrafish where development can be visibly observed presents a complementary model that can be easily extrapolated to humans. This makes the Zebrafish an excellent test subject used in many laboratories to replace higher vertebrate animals such as rats and mice. In addition, they reproduce very easily, passing from the egg to larvae stage in less than three days. The start of a Zebrafish journey in the newly installed Techniplast aquatic housing system at NWU was first observed by Prof Victor Wepener from the Water Research Group at NWU. His particular group are using Danio rerio as a model organism in nanoecotoxicology. Here different toxicological endpoints are used to determine the hazard of nanomaterials when released into the environment. ”I still remember the day I put the first batch of fish into the system, Danio rerio long fins”, says Dr Tarryn Botha. “The fish were maintained at 26 °C in the tanks for a month before we even separated males and females, then for an additional month they were fed on a nutrient rich diet while we gradually increased the temperature (by the touch of a button I may add) to 28°C”. She continued, “A Tecniplast 1.7 L slope tank was used for breeding, the tank has a grid which has a gravel textured bottom as well as a slope with less water on one end to activate fish for spawning. Fish weren’t fed the evening prior to breeding to avoid any waste contamination with the embryos. The breeding tank was placed into a buffer water tank to establish and maintain the temperature in the breeding tank between 26 -28°C. Three gravid females and two sexually mature males were removed from the housing tank placed into the 1.7 L breeding tank and left there overnight. One hour after dawn the adult fish were removed by removing the top section of the tank and leaving the eggs housed at the bottom. The eggs were transferred to a hatching tank in embryo media where the temperature was maintained between 26 -28°C, and the next morning translucent little eggs (not the unfertilized white ones) were everywhere. Ten days later we had around one hundred and fifty free swimming larvae which were fed on rotifers until being fed on crushed adult granules. In three months (and even less while we optimize the tanks) we will be able to start this all again. It all would have gone full cycle, as the journey of a Zebrafish, helps us setup guidelines for new potential (nano)risks”. The Breeding tanks from Techniplast are available in various size designs depending on the research requirements, with external and internal tanks for small and larger groups. For instance, the Techniplast ISpawn-S at NWU, which is also used for breeding, has a 13L capacity to breed up to 20 couples of fish. A large number of synchronised embryos are collected with minimal labour and space requirements. These tanks are specifically designed to match the natural spawning behaviours of Zebrafish and promote fish mating behaviour. 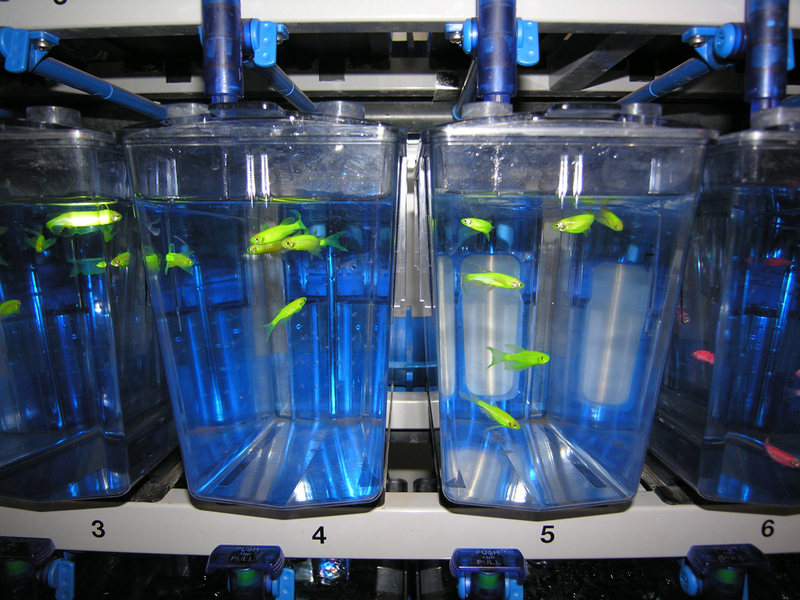 NWU are using the Techniplast Tritone automated diet delivery system, to take the pressure off the labour required for feeding the aquatic fishes. In the process this also helps to reduce fish feeding costs, high variability associated with “more than one person” involved with the feeding process as well as precise dispensing of both liquid and multiple dry pellet sizes. The system also improves hygiene at tank level by minimising the amount of diet residues, improves ergonomics during diet distribution and system water quality by reducing the risk of overfeeding. Forming part of this Bioassay Facility installation were four multilinking Techniplast tank systems, which can be expanded upon in future if required, and a water treatment unit. The water treatment unit has a fine mechanical filter, carbon filtration and high UV disinfection. Other technologies utilised include the recirculating pumps for optimal water flow control, pre-installed back up pumps for redundancy reasons, pressure reader and pressure equalizer for constant pressure at tank level, automatic water exchange at precise intervals, flow meter and cooling system. The fully customised system includes a self-cleaning solution and an advanced monitoring system with remote capability. In addition to the nanoecotoxicology studies by the Water Research Group at NWU, they are using the Zebrafish as a Translational model for Pharmaceutical studies of relevance for Neuropsychiatric disorders, as well as psychobiology and drug action. As these and other research projects involving Zebrafish in South Africa has increased substantially over the last few years, Dr Tarryn Lee Botha established a support network for researchers working with Zebrafish from all sectors of academic research. On 27 September 2017, the inaugural Zebrafish Interest Group South Africa (ZIG SA) seminar was hosted at NWU. Researchers had the opportunity to present their research as well as exchange knowledge, experiences and ask questions relating to Zebrafish. Topics discussed on the day included nanoecotoxicology, neuropsychobiology, cardiomyopathy, epilepsy, wound healing using medicinal plants, genetics, as well as pharmaceutical and immunological research. Four universities (University of Cape Town, Tshwane University of Technology and University of Free State) with researchers from several different departments took part in the seminar forming collaborations to pave the way forward in African research using the tiny Danio rerio. This entry was posted in Latest News and tagged Danio rerio, Largest Bioassay Facility in Africa, Techniplast, Zebrafish.